This is a thoughtful, comforting, and practical book that for those dealing with the pain associated with significant loss. Tappouni explores the grieving process and helps the reader discover new ways to heal from the death of a loved, the end of a marriage, or financial catastrophe. When we experience a loss, writes Tappouni, we are faced with a set of choices. We can allow ourselves to be defined by our loss. We can function as a survivor--basically exist as a victim of PTSD. Or, we can choose to have a life. We can use our loss as an opportunity to live an intentional life. This is a book that teaches the reader how to survive grief and, most importantly, how to adapt and grow from the experience of loss. 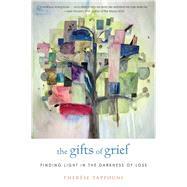 Tappouni, like a close and nurturing friend, walks the reader through the grief process. Her guided meditations are designed to take into account the fact that each one of us experiences the grieving process in different ways. Finally, this is a book that grows out of the author's experience of traumatic loss. Her 11-year-old son was tragically killed in an automobile accident. That experience is what motivated her to help herself and to help others.